It’s a particularly busy time for students on campus. The exam season is in full swing, and finding a seat in the library is nigh impossible, but at least the air conditioning is fixed after a a multi-year struggle! This time, following on from SleepImperial’s Imperial Sleep Week in Autumn 2017, we are instigating a more relaxed approach to promoting sleep. Our sleep survey is spreading around campus, and data collection is going well. If you are an Imperial medical student, you can take part here. Preliminary results are remarkable, and we hope to share with you the write-up in a peer-reviewed academic journal soon. For the week, our banners and promotional materials will be featured around campus, and we hope that you will be able to take a moment to skim over the top tips that we have for you at this busy time. 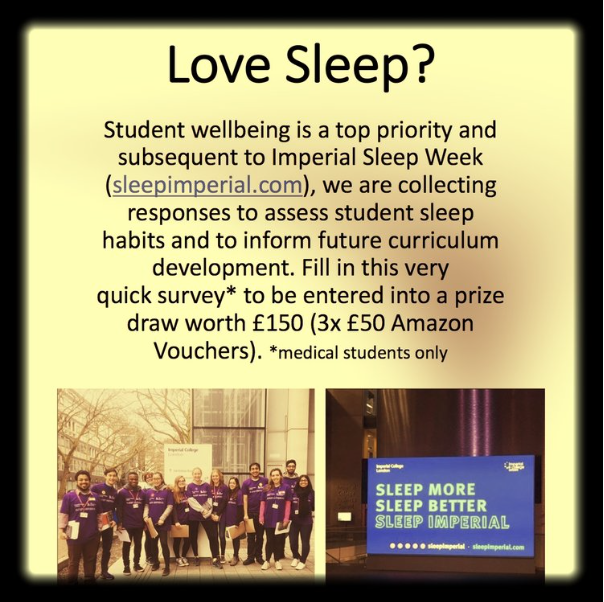 Imperial College’s lovely Occupational Health department have also been promoting the use of Sleepio, an exciting tool grounded in Cognitive Behavioural Therapy to improve individuals sleep. It is freely available for staff and students here. A large group of Year 2 medical students are doing research into various aspects of sleep. They have had a wide-variety of engaging lectures and partaken in exciting activities (including overnight sleep studies!). The students will have practice presentations towards the ends of the week. You are welcome to attend and we hope to share some of their unique experiences and findings with you in upcoming posts. Finally, please remember to take care of yourself at this busy time. For some quality and recent sleep-related reads, the Financial Times has a great special series. Again free to read with Imperial’s institutional subscription. Needless to say, it pays well to sleep well for a better today, tomorrow and distant future. 06/06/18 Some excellent guided meditations for you courtesy of MindLab – many thanks to Dr Gail Davies! Imperial’s own Professor Mary Morrell delivers an excellent talk about the importance of sleep.